BlackBerry (TSX:BB, Nasdaq: BBRY) Q5; can it turn the tide? BlackBerry (TSX:BB, Nasdaq: BBRY) after following a dismal fiscal Q1 earnings release, is on the ropes again. It was first quarter for BlackBerry 10 devices of full availability , and BB only shipped 2.7 million devices running on BB10, short of what investors predicted for. The only two BB10 devices which were available during Q1 were the smartphone touchscreen Z10 and conventional QWERTY-equipped Q10. BlackBerry also announce mid-range Q5 during BlackBerry Live with a physical keyboard and the target of the low end mobile was emerging markets, but the device didn’t launch even until after quarter closed. Can Q5 do the magic? CEO Thorsten Heins on the conference call, said that the BB Q5 has earned a huge technical acceptances at 149 carriers, with 106 of these carriers looking to launch Q5 in 59 countries this quarter. The Q5 was launched in the Arabian Dubai last month, and also debuted in India, South Africa and the U.K. this month. As the arch rivals Samsung and Apple takes over the smartphone market in most of the developed countries, BlackBerry is targeting a strong position in the emerging markets. Blackberry devices sales in North America fell by 4 percent last quarter but at the same time BlackBerry Canadian sales grew quite well, but there was a 28 percent decline in U.S. revenue. Africa, Europe,and Middle East, put up revenue growth of around 31 percent, and Asia Pacific is standing at 17 percent of total sales. The main competitors to BlackBerry Q5 to in the low-end range are Nokia‘s (NYSE: NOK) Asha family and few Samsung’s Galaxy devices. Nokia, smartphone vendor shipped 4.3 million Asha series phones last quarter, which is slightly ahead of 4.1 million BlackBerry devices. Nokia still generates most of its revenue in the emerging market segments like Asia Pacific and EMEA as well. These areas comprised 71 percent of Nokia’s devices revenue in the last quarter. The ecline on year-over-year basis are mainly attributed to aging Symbian than anything else. BlackBerry fully realizes that its BlackBerry 7 devices which targets low end still hold their value and that’s why they are planning a launch of a new BlackBerry 7 smartphone later this year. So far as Q5 revenues have begun to roll in, initial impressions aren’t good. The Q5 is still priced too high. BlackBerry’s average selling prices had been declining for past few years on BlackBerry 7 devices. The company is expecting BlackBerry 10 to change all of that. 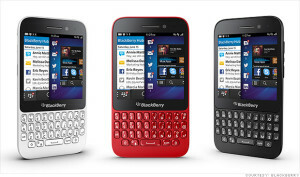 BlackBerry can expect higher revenues and selling of the Q5 selling if it had priced it more aggressively.